Abstract. The dramatic calving of the Mertz Glacier tongue in 2010, precipitated by the movement of iceberg B09B, reshaped the oceanographic regime across the Mertz Polynya and Commonwealth Bay, regions where high-salinity shelf water (HSSW) – the precursor to Antarctic bottom water (AABW) – is formed. 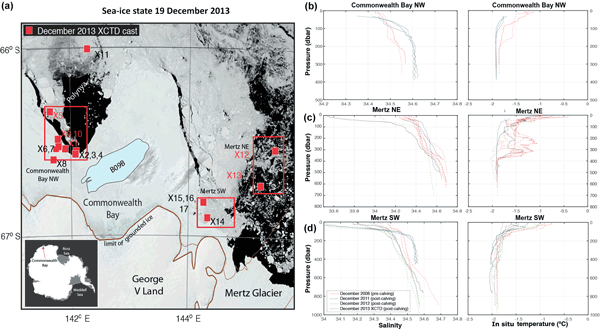 Here we present post-calving observations that suggest that this reconfiguration and subsequent grounding of B09B have driven the development of a new polynya and associated HSSW production off Commonwealth Bay. Supported by satellite observations and modelling, our findings demonstrate how local icescape changes may impact the formation of HSSW, with potential implications for large-scale ocean circulation. How to cite: Fogwill, C. J., van Sebille, E., Cougnon, E. A., Turney, C. S. M., Rintoul, S. R., Galton-Fenzi, B. K., Clark, G. F., Marzinelli, E. M., Rainsley, E. B., and Carter, L.: Brief communication: Impacts of a developing polynya off Commonwealth Bay, East Antarctica, triggered by grounding of iceberg B09B, The Cryosphere, 10, 2603-2609, https://doi.org/10.5194/tc-10-2603-2016, 2016. 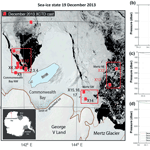 Here we report new data from in situ oceanographic surveys and high-resolution ocean modelling experiments in the Commonwealth Bay region of East Antarctica, where in 2010 there was a major reconfiguration of the regional icescape due to the collision of the 97 km long iceberg B09B with the Mertz Glacier tongue. Here we compare post-calving observations with high-resolution ocean modelling which suggest that this reconfiguration has led to the development of a new polynya off Commonwealth Bay.